LOS ANGELES, California, June 11, 2010 (ENS) – An explosion at a South Los Angeles recycling plant this morning touched off a giant fire. City fire spokesman Cecil Manresa says the explosion at the United Alloys and Materials industrial recycling complex occurred at 11 this morning, sending flames through the roof and black smoke high into the sky. The fire was extinguished at 1:22 pm with no injuries reported, Manresa said. Many firefighting units from both Los Angeles city and county attended the scene at the junction of E. Slauson Avenue and S. Central Avenue in the Huntington Park area. Titanium shavings in bins caught fire, Manresa said, and the heat caused them to react. “Getting water into the fire was the difficulty,” he said. This is the second fire this week at a Los Angeles used materials site. 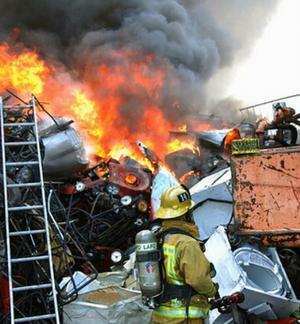 On Saturday, June 5, firefighters were called to a scrapyard in the Wilmington area near the Port of Los Angeles. They arrived to find a black column of smoke rising straight into the air from a fire hidden deep within a huge pile of metal at the Pick-Your-Part Auto Yard. Even with personnel, water and equipment on hand, the fire grew in intensity in a pile of metal the size of a football field. It took more than 250 firefighters 32 hours to extinguish the stubborn blaze, said Los Angeles Fire Department spokesman Devin Gales. Crews were able to keep two tanks housing gas and oil in the path of the flames from catching fire. One firefighter and one civilian were injured. The cause of that blaze is listed as accidental and estimated dollar loss is yet to be determined. Until we have an idea what the actual cause of today’s fire was we don’t know whether or not it’s just coincidental, he said.